The Sovereign: by the grace of God and the will of the people, Queen of Madagascar, Protectoress of the Laws of the Nation, with the style of Her Majesty. The sons and brothers of the Sovereign: Prince (personal name) with the style of His Royal Highness. The daughters and sisters of the Sovereign: Princess (personal name) with the style of Her Royal Highness. Other selected male members of the Royal line: Prince (personal name) with the style of His Highness. Other selected female members of the Royal line: Princess (personal name) with the style of Her Highness. 1. Zanakandriana (the reigning Royal House). 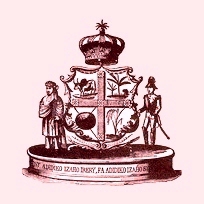 Madagascan society was also ranked according to a system of "honours" known as Voninahitra (or: "the flower of the grass"), which were based on military ranks. These ranged from 1-Honour for a private soldier, up to 14-Honours for a Field Marshal, and 16-Honours for the Mpitaiza Andriana. Although based on military ranks, the system extended to civilian offices and precedence at court. Individuals could be promoted to higher honours in recognition of merit or distinction and were accorded breast stars and badges, which resembled the French Legion of Honour. Some writers have mistakenly taken these insignia for an order. Revived and modified by the French colonial authorities on 11th December 1895 (with new insignia introduced on 28th September 1921). 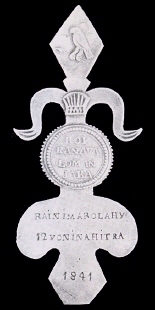 Voninahitrafaharoambinifolo (12-Honours) - breast badge. 16-Honours - Voninahitrafaheninambinifolo or, the Mpitaiza Andriana. 15-Honours - Voninahitrafahadiniambinifolo or, the Princes of the Royal Family. 14-Honours - Voninahitrafahefatambinifolo or, Field Marshal. 13-Honours - Voninahitrafahatelambinifolo or, General. 11-Honours - Voninahitrafaharaikambinifolo or, Major General. 10-Honours - Voninahitrafahafolo or, ColonelCommandant/Brigadier. 9-Honours - Voninahitrafahasivy or, Colonel. 8-Honours - Voninahitrafahavalo or, Lieutenant Colonel. 7-Honours - Voninahitrafahafito or, Major. 6-Honours - Voninahitrafahenina or, Captain. 5-Honours - Voninahitrafahadini or, Lieutenant. 4-Honours - Voninahitrafahefata or, Sergeant Major. 3-Honours - Voninahitrafahatelo or, Sergeant. 2-Honours - Voninahitrafahaova or, Corporal. 1 honour - Voninahitravoalohany or, Private.